If you suffer from arthritis or carpal tunnel syndrome the last thing you want is to be reminded of this with a big, bulky and sweaty wrist brace. The Brace Yourself For Action Support Gloves are silky smooth and breathable, allowing you to wear them all day and hardly remember they are there. Designed with a compression strap that applies the gentle pressure you need for added support. Sold per pair. Are the support gloves latex free? Is there an option for a left hand brace in this style? I see a size option but no other. Thank you for your question. 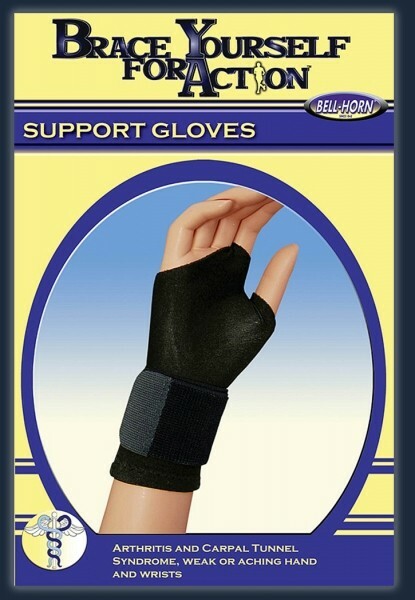 The Bell-Horn 'Brace Yourself For Action' Support Gloves are sold "Per Pair" so you will receive a right and a left with your order.